This week has ruled. I need to start taking more pictures of things I'm doing. Monday I had a dinner date with Colleen and we made the first batch of sangria this spring/summer will see. I also made my mom's pasta salad, which i LOVEEEE so much. It's seriously delicious, and seriously makes so much, so you can have lunches and dinners for days. Then we rode bikes back to her side of town together, and man I miss riding with that girl. Tuesday was bowling, but before I even got close to that awesomeness, I spent the day with my room mate. We made a yummy breakfast, she helped me work on a secret surprise for a certain someone, and then we went out to Terrain where I picked up some awesome plants to put in my room. Then we went to Happy Hour at Dos, which was delicious and awesome per usual. Bowling was extra fun because Richard came to sub for us. I love bowling so much, so it's fun when I can share it with someone I love! Wednesday was a good work day, I've been riding my bike much more this week because of the BEAUTIFUL weather. Elsa and I sat out in Rittenhouse with our lunches. 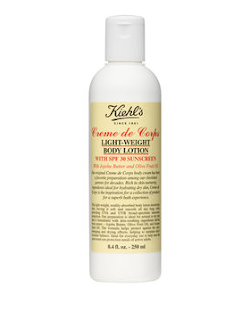 I bought a new lotion from my beloved Kiehls, it smells like heaven and will be perfect for those days in the park. It's a part of their Creme de Corps line, which is most possibly the best lotion ever. It's so thick and rich and smells SO GOOD. This is a lighter weight version for every day and has SPF 30 in it! The Jojoba Oil and Olive Fruit Oil smells so gooddddddddddddddddddd! Then Richard came over for dinner, and I of course needed something sweet after dinner, so I made chocolate covered strawberries. We had a ton of chocolate left, so we made almond clusters too. And then I sprinkled them all with different toppings: Cinnamon, Cocoa, Lavender & Grey Sea Salt, Sea Salt. I haven't tried any of them yet, but I can't wait to! I love sharing my life with that dude. He's the best ever. We're leaving in less than a week for a little trip out to Portland/Seattle. I couldn't be more excited to go "home" & see my brothers, meet my nephew, play with my niece and see my friends! This week has been a taste of Summer and I seriously couldn't not be more excited about it!!!!!!!!!!!!! !